Designed for use on machining centres, milling, drilling and boring machines and B-axis lathes with automatic tool change, a new generation of touch probes has been introduced by HEIDENHAIN for aligning and measuring workpieces, tool setting and detecting cutter wear and breakage. The compact probes, which are said to exceed the performance of the German manufacturer’s previous models by a considerable margin, are compatible not only with HEIDENHAIN controls but with other leading makes of CNC system as well. Wear-free optical sensing and through-probe coolant flushing or air blowing to clean the surfaces being measured are pre-existing attributes pioneered by HEIDENHAIN that continue to be provided in the new products. Overlaid on the already high specification are several novel features, one of which is the ability to feed signals back to the control via an infrared (IR) or radio link, or both. The ability to switch between the two modes of transmission is not available on any other make of touch probe, according to Neil Prescott, managing director of HEIDENHAIN (GB), Burgess Hill. The hybrid design means that the same unit can be swapped between different machine tools on a shop floor, irrespective of whether they are equipped with IR or radio communication, saving the cost of buying extra probes. A further advantage, mainly applicable to larger machines, is mixed operation using both forms of data communication. It allows the long range of radio transmission to reach the tool changer so the probe can be activated, ready for use. Subsequently switching to IR during probing exploits the increased speed and accuracy of data transmission at infrared frequencies. A radio beam also enables the coordinates of deep features being probed in complex components to reach the receiver, whereas IR may not provide a signal at all, however close the probe is. So the best of both radio and IR communication technologies is available to a machinist using HEIDENHAIN’s new hybrid probes, together with the SE 660 transmitter/receiver unit manufactured specifically for them. Another new and in this case patented feature is the inclusion of an optional, 18.5 mm deep rubber coupling in the body of the workpiece probes, positioned between the stylus and shank to protect the unit in the event of an axial collision. The safety feature is effective during measuring routines, which involve relatively slow movements. Should the probe body impact the workpiece, the fixture or the machine structure due to an error in the program, the coupling deflects. An instruction is automatically sent within a fraction of a second to the control, which stops the axis feed drives. This safety mechanism is in addition to existing measures taken to protect the probe tip from impact damage. They include a large deflection of the stylus (for example 5 mm in all directions for a 40 mm long version) and rated breaking points in the stylus and connecting pin. Inclusion of the rubber coupling offers the added advantage of thermal isolation of the stylus from the spindle, eliminating expansion or contraction and resulting in more accurate measurements. When using conventional touch probes, heat transmission can be especially problematic during long, in-process measuring cycles. Underlining the superiority of the latest HEIDENHAIN touch probes is the inclusion of two additional new features relating to the probe’s power supply, which is provided by two replaceable batteries. Whereas other touch probes are either working or in a single standby mode, HEIDENHAIN has gone further by providing more intelligent battery management. Five sleep levels become progressively deeper, drawing less and less current the longer the probe remains unused. Activation from lower standby levels takes only a split second longer, so productivity is barely compromised. It means that extended periods of inactivity do not unduly drain the batteries, leading to a big increase in battery life and much less frequent replacement. Another benefit is that commercially available, standard rechargeable or non-rechargeable batteries of any type or make can be used and are easily exchanged by the user. So a company is not tied in to a single supplier of one type of battery technology (lithium, alkaline or NiMH) and can shop around for the most cost-effective option. Manufacturers that have adopted on-machine part and tool probing know that replacement batteries are a significant consumable cost, which can now be minimised to improve profitability. For many years, a feature of HEIDENHAIN touch probes has been optical sensing. It is distinct from mechanical switching used by many probe manufacturers in that the optical method is non-contact and wear-free, allowing accurate, highly repeatable probing for as long as the unit is serviceable. Repeatability is 2 σ ≤ 1 µm at 22°C for a 40 mm long stylus with 4 mm diameter ball at a probing speed of 1 m/min. The system employs a lens that collimates light from an LED and focuses it onto a differential photocell, which produces stable trigger signals each time the stylus deflects. Scarcely any loss of probing accuracy was recorded after the sensor was tested over five million switching cycles in the manufacturer’s R&D department at its Traunreut headquarters and factory near Munich. HEIDENHAIN has been developing touch probes for workpiece and tool measurement on metalcutting machines for over 30 years. 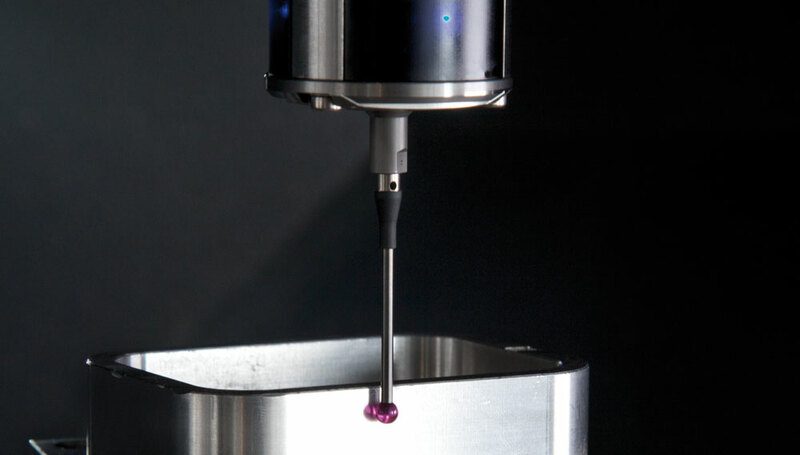 Such probes promote long periods of unattended production, reduce set-up times, save the expense of costly bespoke fixtures, increase machine usage, improve the dimensional accuracy of finished workpieces and minimise rework and scrap. All of the new-generation probes are much more compact than their predecessors and consequently allow extra freedom for swivelling and tilting, allowing better access to awkward areas. Probing is performed automatically under program control at up to 5 m/min, or can be carried out manually. A variety of mounting options is available for a wide range of taper shanks and toolholders as well as with a threaded hole for mounting the probe on a lathe or grinder. The new TS 460 for workpiece touch probing and the table-mounted TT 460 with contact plate for tool length and diameter measurement are the new, wireless, hybrid options with radio and IR signal transmission. Please click here to view a video of the latest generation TS 460 workpiece touch probe in action. HEIDENHAIN also offers two cable-connected models that have even smaller dimensions – the TS 260 workpiece touch probe, which is suited to use on grinding machines as well as machining centres, and the TT 160 touch probe for tool detection and measurement. Tel: +44 (0)1444 247711. Fax: +44 (0)1444 499125.